The 2518 is a dedicated, portable DMX controller for smaller applications. This capable controller offers what a good controller should - ease and speed. The 2518 is an easily programmable DMX controller for fast access to DMX controlled fixtures. 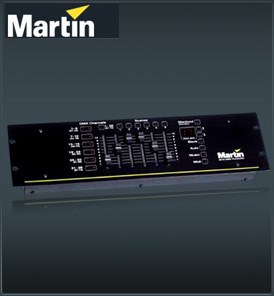 It is a dedicated DMX controller for smaller applications. The 2518 can be manually or automatically triggered or can be triggered from a music input circuit, guaranteeing a dynamic and precise show. Additionally it is possible to call up pre-programmed sequences or certain scenes via MIDI to enable bands to control their lighting with their music or to create integrated show control applications. The 2518 is recommended for fixtures using up to 6 DMX channels, such as the Punisher, Destroyer, SynchroZap, Acrobat, MX series, CX series and the Switch Pack. Twin Option - The 2518 Twin Option allows two 2518 controllers to be connected in a Master/slave connection thereby creating an easy to operate and powerful 144 DMX channel controller. The Twin configuration is ideal for clubs, bands and mobile DJ's who require additional control capability. The 2518 Twin Option allows each bank to consist of 12 scenes with both the bank number and scene number displayed at the same time on each controller's display. With the 2518 Twin Option it becomes easy and logical to control fixtures using up to 12 DMX channels as the operator now has 12 faders to work with for instant control. This makes the 2518 Twin capable of controlling a larger number of fixtures.